What could be easier or more delicious and nutritious than a beetroot salad? Beetroot is a real favorite British vegetable, and despite having fallen well out of favor (thanks to the British love of the pickled foods), it is now back on the menu big time now that we understand the health benefits. 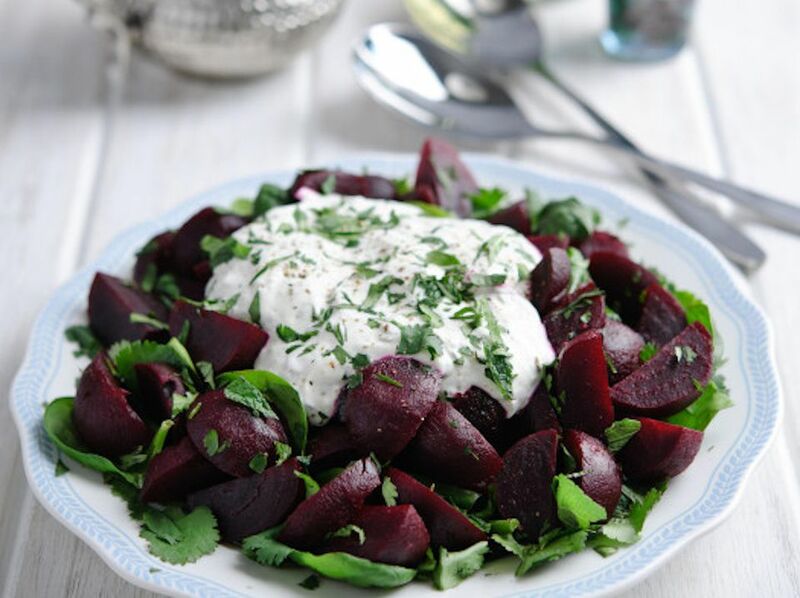 This beetroot salad recipe has a twist, it has a lovely creamy dressing made using organic natural yogurt (our favorite brand of Rachel's Organics is particularly good). The yogurt is mixed with garlic and cumin, and with the mint and coriander/cilantro in the salad makes it a very Moroccan-style dish. First, make the dressing. Mix all the dressing ingredients together in a small bowl. Taste then season with salt and pepper accordingly. If you have the time, leave the dressing to infuse for an hour or so, then assemble the salad as follows. If you do not have the time, no worries, it will still taste just as good, making it in advance simply lifts the flavors even more. Take the beetroot and chop into even-sized wedges. Mix together the beetroot wedges, the washed and drained spinach with most of the chopped mint & coriander in a large serving bowl (reserve a little of the chopped herbs as a garnish for the salad). Before serving, drizzle the dressing over the salad, then as you are ready to serve finish by sprinkling with the remaining chopped herbs. The salad can be served on its own with crusty bread and some salty butter, or serve as a side dish with meat or fish, or as part of a range of other salads. Note: If you have raw beetroots from the garden or the market then consider roasting them rather than boiling. Roasting beetroots help retain a lot of the flavor and the nutritional value, it intensifies the flavor as well. For this recipe, you will then have to dip the beetroot into vinegar (not pickle it) to give it the correct flavor.